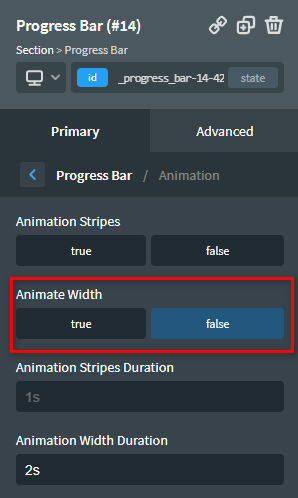 If you want to animate the width of a Progress Bar element, you just have to enable it in the option. The only problem is that the animation will start as soon as the page is displayed. Which is fine if your progress bar is already in the viewport. But if it is not, you won't see the animation when it enters the viewport. Replace #_progress_bar-14-429 by your progress bar ID. That's it. There is nothing else to do.